Authentic, full-scale prop replica of Star-Lord's helmet! Peter Quill's headgear from Guardians of the Galaxy. Crafted from an original screen-used helmet. Limited to only 750 pieces worldwide! Includes a mannequin head display base and a numbered plaque. This authentic, full-scale reproduction of Peter Quill's helmet seen in the Guardians of the Galaxy film is made of high-quality fiberglass, metal, and plastic. Limited to only 750 pieces worldwide, the piece includes a special mannequin head display base, a numbered plaque, and a certificate of authenticity with the prop's story. 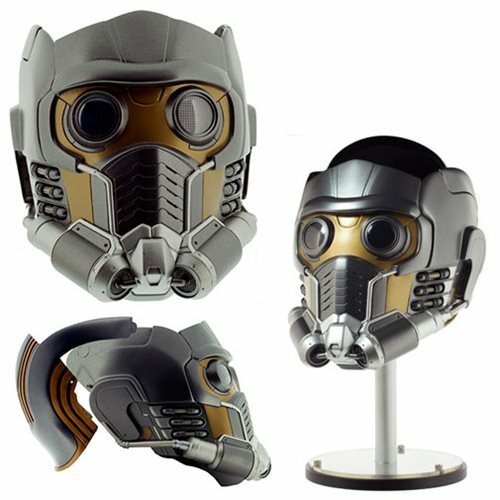 The Guardians of the Galaxy Star-Lord Helmet 1:1 Scale Prop Replica measures approximately 13-inches long x 9-inches tall x 7-inches wide.